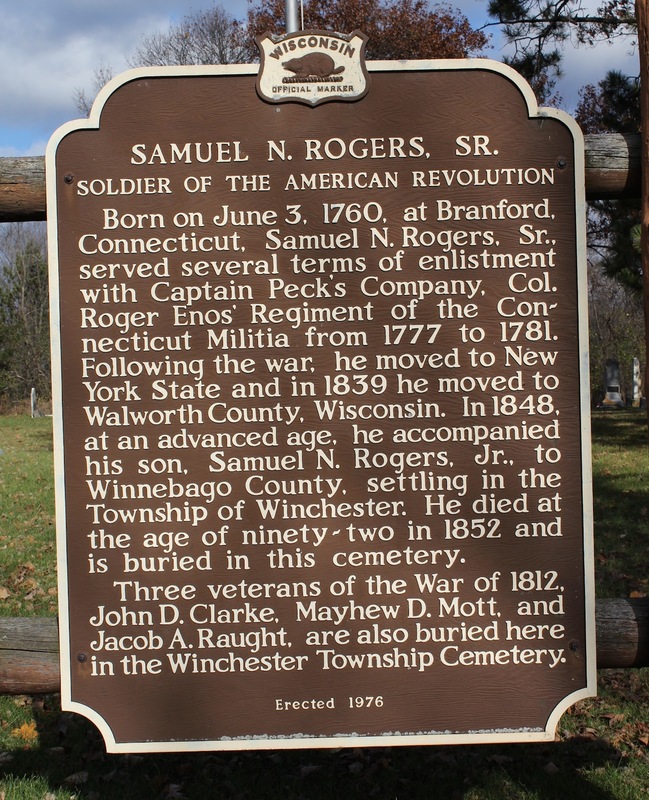 Born on June 3, 1760, at Branford, Connecticut, Samuel N. Rogers, Sr., served several terms of enlistment with Captain Peck’s Company, Col. Roger Enos’ Regiment of the Connecticut Militia from 1777 to 1781. Following the war, he moved to New York State and in 1839 he moved to Walworth County, Wisconsin. In 1848, at an advanced age, he accompanied his son, Samuel N. Rogers, Jr., to Winnebago County, settling in the Township of Winchester. He died at the age of ninety-two in 1852 and is buried in this cemetery. 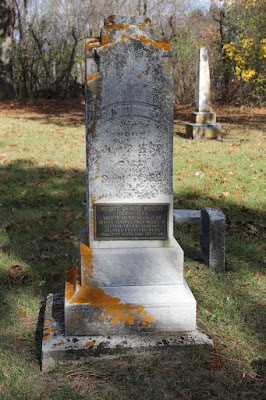 Three veterans of the War of 1812, John D. Clarke, Mayhew D. Mott, and Jacob A. Raught, are also buried here in the Winchester Township Cemetery. The marker is located at Winchester Cemetery on westbound Grandview Road, west of its intersection with Trails End Road / Grandview Road, at 5510 Grandview Road, Larsen, Wisconsin 54947. NOTE (August 25, 2012): This marker is in the middle of miles of cornfields. The only parking is to carefully maneuver along the side of the road to avoid getting stuck in a ditch. 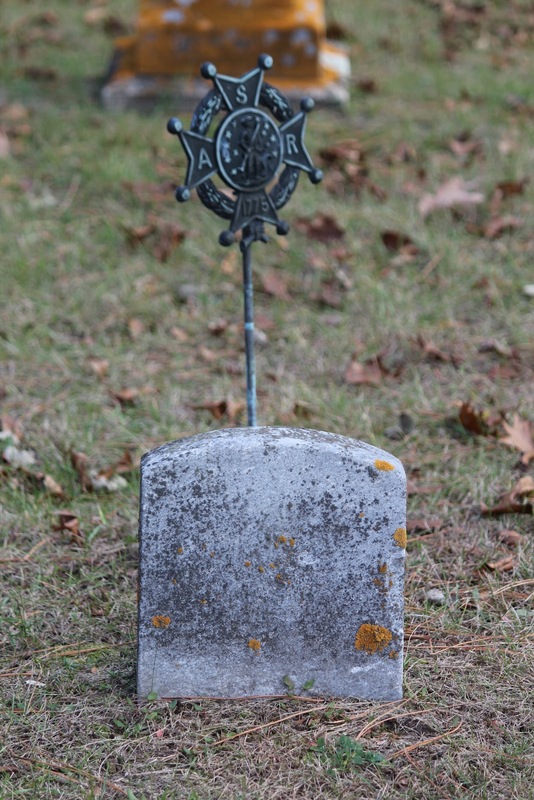 The cemetery is in great disrepair -- several markers have fallen over, others are illegible. I never did find John D. Clarke, Mayhew D. Mott or Jacob A. Raught, but I did find one Damon Brightman (see below). Wisconsin Revolutionary War Patriots (click on "Patriot Book" for alphabetical listing and short biography of all 41 Wisconsin Revolutionary War veterans). See also, Private Samuel Rogers, also at this location. 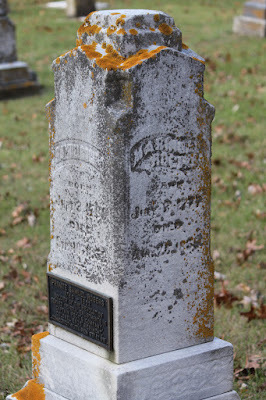 The Rogers Family headstone honors Samuel. 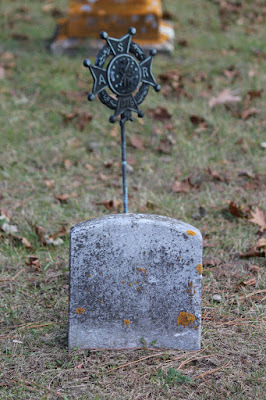 Anna C., wife of Samuel N. Rogers, is buried close to her husband. 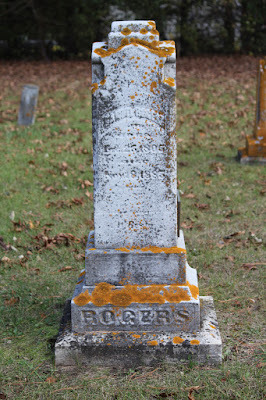 Samuel N. Rogers, Sr.'s headstone. Hosea M. Rogers, Civil War Veteran. Mercy Rogers, Civil War Veteran. Nearby headstone of Corporal Damon Brightman, Civil War Veteran. 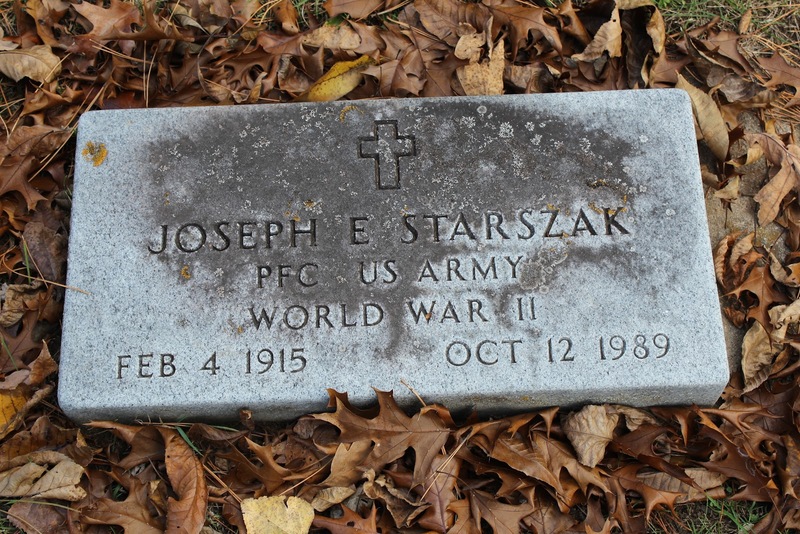 Nearby headstone of Joseph E. Starszak, World War II Veteran. Samuel N. Rogers, Sr. is buried in Oak Ridge Cemetery. View from across Grandview Road. The marker is located in Larsen, Wisconsin.